To the west, Hong Kong is separated by the Pearl River estuary, facing Macao and Zhuhai City; and to the east and south, it is overlooking the vast South China Sea. Relying on such advantageous geographical position, Hong Kong has now developed into an economic center in Asia. Hong Kong has a sub-tropical monsoonal climate, with a mean annual temperature of 22oC and a mean annual precipitation of 2,225 mm, sometimes over 3,000 mm. It is frequently visited by typhoons and tropical storms in summer and autumn. Hong Kong has a population of 6.78 million as of 2000, among which, 97.5% are Chinese. And among the aliens, the Philippines people constitute the overwhelming majority, the Americans, Britons and Indians and others come second. 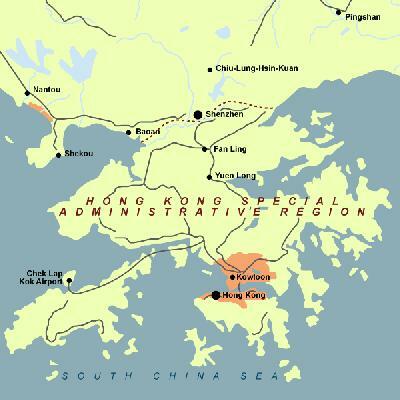 The daily language used among the Hong Kong residents is mainly Cantonese (Guangdong dialect). The official languages being used are Chinese and English. Hong Kong is a Special Administration Region of China since China resumed its sovereignty from the British Government on July 1, 1997. Hong Kong (Xianggang in mandarin), named the Pearl of Orient, got the name from its river Xiang River. As early as 4,000 years ago, Chinese ancestors had already settled in this area. During the Tang Dynasty (618-907), the imperial army was once stationed here. From 1842 to 1898, the British aggressors forcibly occupied the Hong Kong Island, Kowloon and the New Territories one after another and the Hong Kong region became a British colony and was ruled by the British. On December 19, 1984, the Government of the People's Republic of China and the Government of the United Kingdom of Great Britain and Northern Ireland signed the Joint Declaration on the Question of Hong Kong. And on July 1, 1997, China resumed the exercise of sovereignty over Hong Kong, thus Hong Kong has returned anew to the embrace of the motherland. Hong Kong today is a flourishing international metropolis, and the gold trading market and financial center as important as New York, London and Zurich. It is also the free port of the Far East and one of the centers for trade and hipping in Asia-Pacific region. The Hong Kong Island is the most thriving place of the whole of Hong Kong and is also the seat of the Hong Kong Government bodies. On both sides of the streets, there are flourishing commercial towers and shopping centers, offices of the world famous financial bodies, shipping institutions and the headquarters of trade companies, and consulates of various countries and regions. The renowned Deep Water Bay and Repulse Bay are all located here, which are Hong Kong's mainly tourist area and residential quarters of the first class. Kowloon is one of the centers of industrial and commercial activities and one of the world busiest airports -- the Kai Tak international airport is located at Kowloon. The Victoria Harbor, one of the three natural deep-water harbors of the world, is situated between the Kowloon Peninsula and the Hong Kong Island. By utilizing the excellent advantages, Hong Kong has gradually developed into one of the world shipping centers. During the past several decades, the economy of Hong Kong has undergone an extremely rapid development and its economic strength is getting momentum with each passing day, thus forming six great pillars of industries -- trade, finance, manufacture, shipping, real estate and tourism. Big companies and banking corporations of many countries throughout the world have come to Hong Kong for trade. Every year there are several million tourists coming to Hong Kong for visit and thousands of huge ships coming in and out of Hong Kong harbors, and everyday there are hundreds of airplanes taking off and landing in Hong Kong international airport. In the commercial towers and shopping centers, you will find exquisite merchandise, a feast for the eyes. It looks as if international fairs of merchandise from various countries throughout the world were held here everyday. Hong Kong's communications are highly developed, with subway and ground railway, highway, undersea tunnels, motorway interchange, viaduct, ferry and airport like a piece of huge network knitting the whole city together. Hong Kong is a city for tourism, which is known as a fine place for "visits, shopping and recreation".